I’ve entered into discussions this week about some improvements I want to make to the press, and this recalled the process some 6-7 years ago now, of how the press came to be built. As mentioned in the “About” section, the original of ours was the so-called Franklin Press, illustrated here. It is in the collections of, but as I understand not currently displayed at, the Smithsonian Institution in Washington, DC. 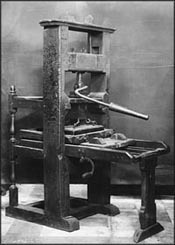 Quite a few enthusiasts have used the Harris/Sisson publication of 1978 to construct their own replica presses; among them the British Library and Amberley Museum in Sussex. We had some extra requirements, namely the need to travel with this press and show it in different venues. We turned to Paddy Murfitt, a Norfolk craftsman who is also a historical re-enactor and therefore understood what we were trying to achieve. He explained that there would be some compromises – first and foremost the wood. If we constructed our press of oak as it should be(sadly, elm is no longer an option) then we wouldn’t be moving it anywhere. So we chose Scandinavian pine. It seems that there’s pine and pine. If it’s grown in the far North, the rings are closer, making the wood denser. He then studied the design closely and was able to identify a core part of this wooden machinery that always has to stay together. The other parts are secured on site, but come apart for travelling.